With the cold winter evenings upon us, I have been thoroughly enjoying my Golden Milk before bed each night. Although it is traditionally made using dairy milk, it can be equally as nourishing using a healthy nut milk alternative such as homemade almond milk. Since I am drinking the Golden Milk on a nightly basis, I often prefer this recipe over the dairy version which can be a bit too heavy for me before bed and leave me with a coated tongue and congestion in the morning. Almond milk (specifically homemade) is much lighter by nature and easier for many individuals to digest. When making it by scratch as I fully recommend, the ingredients are very simple, fresh and nourishing. Making it at home allows you to avoid preservatives and stabilizers that are in almost all the store bought nut milks. In this recipe, it is mandatory to soak the almonds overnight and blanche them in the morning, making them suitable for all dosha types, easier on the digestion and allows a much smoother, creamier beverage. 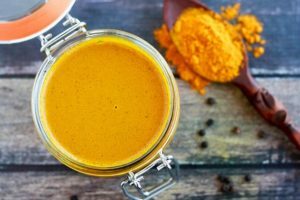 Although Golden Milk is a delicious treat, it is equally as healing, possessing a long list of heath benefits. This specific recipe incorporates not only the healing properties of almond milk and turmeric but also ashwagandha, ginger, saffron, black pepper and ghee. Together this soothing tonic is perfect as daily medicine for both our overall physical and mental health. Here are some of the main health benefits to expect. This Golden Milk recipe is generally safe and gentle to make and take on a nightly basis. In fact to really receive the health benefits of this beverage, consistency is essential. Although for most individuals this recipe will promote health and balance in the system, this may not be true for you as an individual. Please talk to your doctor or holistic health practitioner before beginning any herbal regimen, especially if you are on medications, pregnant or breastfeeding. 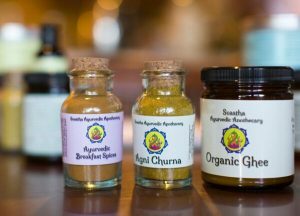 *These herbs and spices can be replaced by 3-4 tsp of our Svastha Golden Milk blend. 1. Soak the almonds overnight in water, or for at least 4-6 hours. 2. Once soaking time is complete, strain the soaking water and discard. 3. Peel the skins off by simply applying a bit of pressure and popping the almond out. As long as the almonds have been soaked properly, this should be very easy to do. 1. Place the filtered water, blanched almonds, hemp seeds, soaked dates (using the date soaking water as part of the 4 cups), ashwagandha powder and entire list of spices in a high speed blender. 2. Blend on high for 2-3 minutes or until the mixture is completely creamy and smooth. 3. Generally the Vitamix or Blendtec blenders will not need straining at this point. However, if your blender is not quite as strong, strain out any almond bits using a fine mesh strain, a cheese cloth or a thin muslin cloth. This is extremely important to have a pleasantly smooth texture! 4. From here, place the amount of prepared Golden Milk that is desired immediately and pour it in a small sauce pan. It is often recommended to drink 8 ounces each day. Any extra can be stored in an airtight glass jar and refrigerated for up to 4 days. 5. Heat the Golden Milk in the pan on a low simmer stirring frequently. Add in 1 tsp of ghee for each 8 oz cup of Golden Milk. Simmer here until the ghee is completely melted and the milk is soothingly warm. 6. Once the desired temperature is found, pour the milk into your favorite mug. Let the drink cool to around 108 degrees (give or take) and then stir in 1 tsp of honey* for each cup. 7. Sip on this beverage each night before bed as a slightly sweet, nourishing treat. Your body and mind will thank you! *Honey becomes toxic to the system when heated over 108 degrees. This recipe is great as is for Vata types and during times of Vata imbalances. It is beneficial for calming the mind, nourishing the nervous system, promoting sound sleep, strengthening the body, reducing dryness, alleviating constipation and increasing Ojas (immunity, vitality). Overall this recipe is beneficial for Pitta types. If this recipe seems too heating, it is recommended to replace the honey with maple syrup and reduce the amount of ginger by half. The ashwagandha can also be replaced with shatavari (which is more cooling) as needed. This recipe can be a bit heavy for Kapha, especially if a Kapha imbalance is present. In this case, one should reduce the amount of blanched almonds to 30 and the hemp seeds to 1 Tbsp. 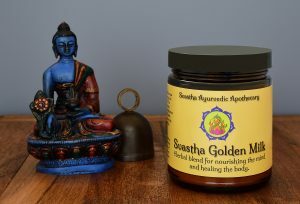 The ghee and dates should be omitted, although the honey is very beneficial for Kapha and should remain. The spices can also be increased, especially the ginger and black pepper which will help to reduce any heaviness of the almonds and increase the metabolism and digestive fire. Try our NEW Svastha Golden Milk blend!